This will be a fascinating excursion to discover the sacred art and the importance and power the church had in this city. It is not accidental that the historical centre is full of churches, almost 20 in total. 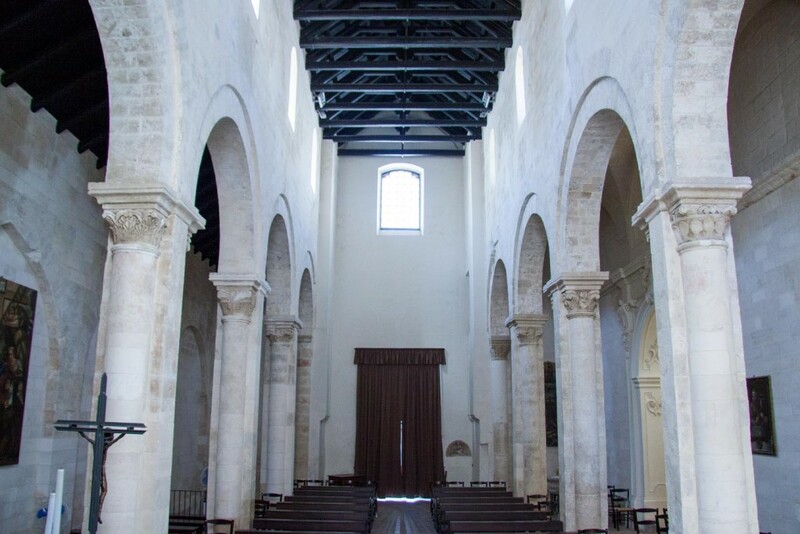 It is impossible to visit Monopoli without visiting the fascinating Cathedral, a spiritual reference point, a treasure trove of art. It was built in the 12th Century and restructured and enlarged in the 18th in the Baroque style. You will discover a peaceful and deeply religious atmosphere inside. Erected in the 12th Century by Bishop Romualdo then re-built and enlarged between 1742-1772 by two “master builders/ engineers” Michele Colangiuli and Pietro Magarelli. From the outside the majestic façade with two orders is impressive, with three entrances and a large central window, a dramatic wall with statues and then the interior in the shape of a Latin cross, the central nave which rises to a large decorated dome. On the vault of the apse you’ll see the upper chapel, the sanctuary of the “Madonna of the Madia” where the sacred byzantine icon is preserved. 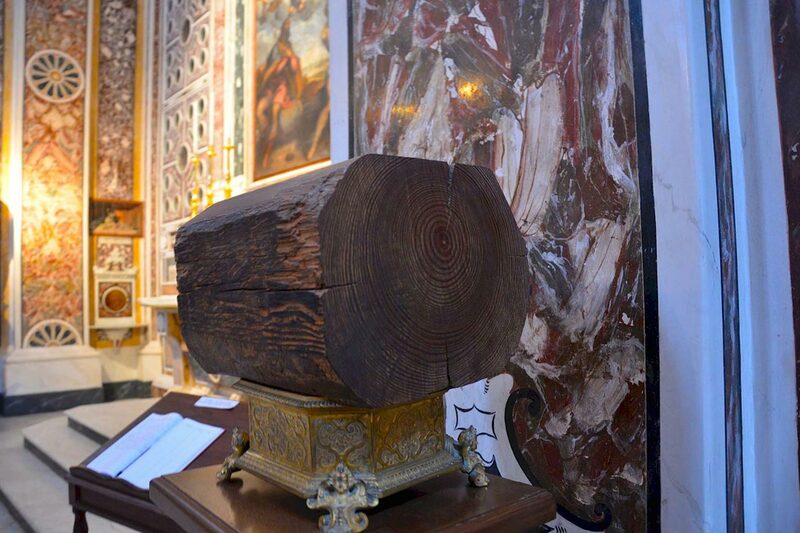 According to local legend it miraculously reached Monopoli carried on a wooden raft the night of 16th December 1117. Other art works worth seeing are the side statues of St Joseph and St Michael by the sculptors Giuseppe Sanmartino and Giovanni Cimafonte and the frescoes by Pietro Bardellino and M. Signorile, also the series of works by De Mura (1755). Your visit will include other fascinating and notable decorations – the stucco work, the Corinthian capitals, the marble work, the paintings and sculptures. Another lasting note is the beautiful, imposing bell tower (17th Century) with its strange pointed cone finish. 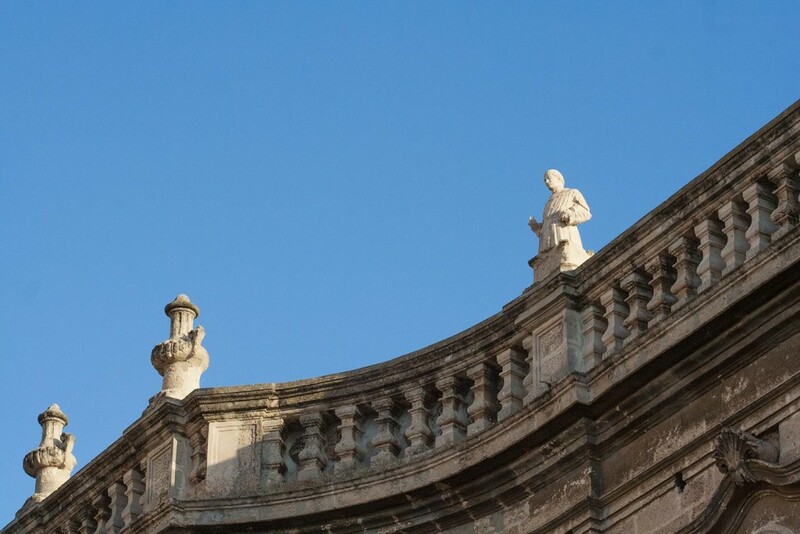 Even if it is hidden it would be difficult to ignore the sculptures (16th Century) which adorn the exterior, interesting work by a noted Apulian sculptor Stefano di Putignano. Another point of interest is the deep steps which leads into the bowels of the ancient church from which the sound of the sea can be heard. The ancient port canal of the city begins here. At one time this ancient church was on the canal entrance but the Normans sealed it with sand in 1049 for protection. 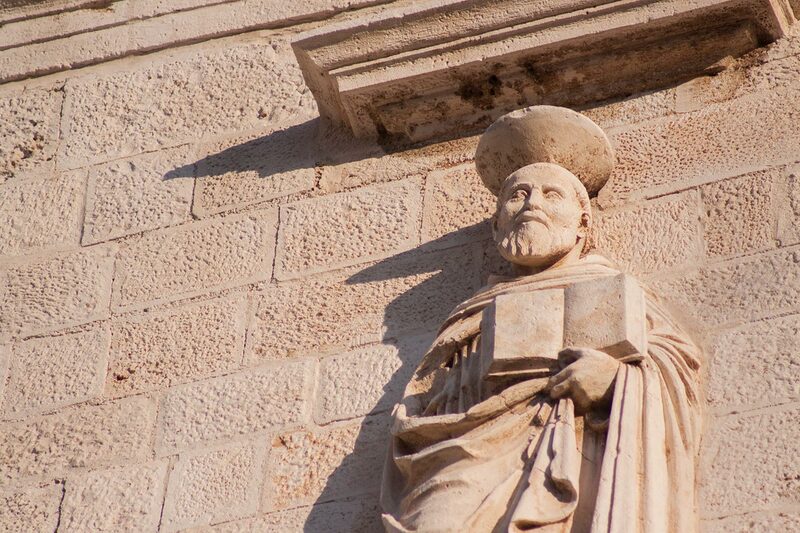 The external sculptures by Stefano di Putignano were designed to indicate the location of the church (16th Century) which originally belonged to the church of St. Mary la Nova. The church interior divides into 2 areas: the Naos reserved for the congregation and the Bema for the clergy. 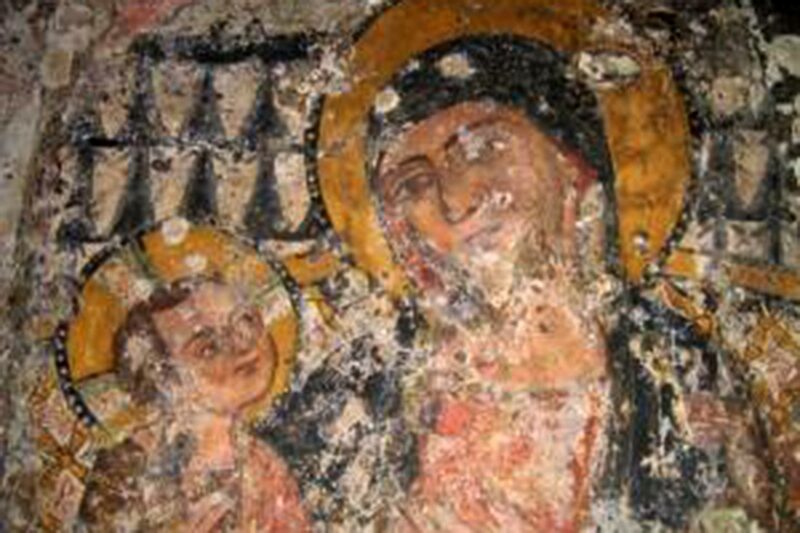 A recently restored fresco of the Madonna and Child dating back to the 13th Century can be admired. As you walk towards Plebiscito Square and the Town Hall this attractive and sacred building will capture your attention. Dating back to the 16th Century it stands elegantly with decorative sculptures and the upper façade has a magnificent rose window. 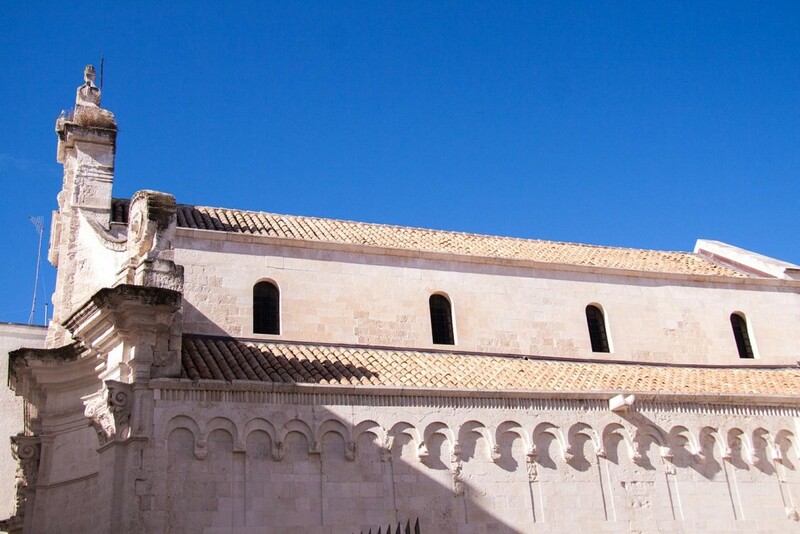 You’ll immediately admire the late 15th Century façade, three rows divided by columns and pillars. The main door, with its richly decorated and flower patterned frames, draws attention together with the magnificent stone rose window. 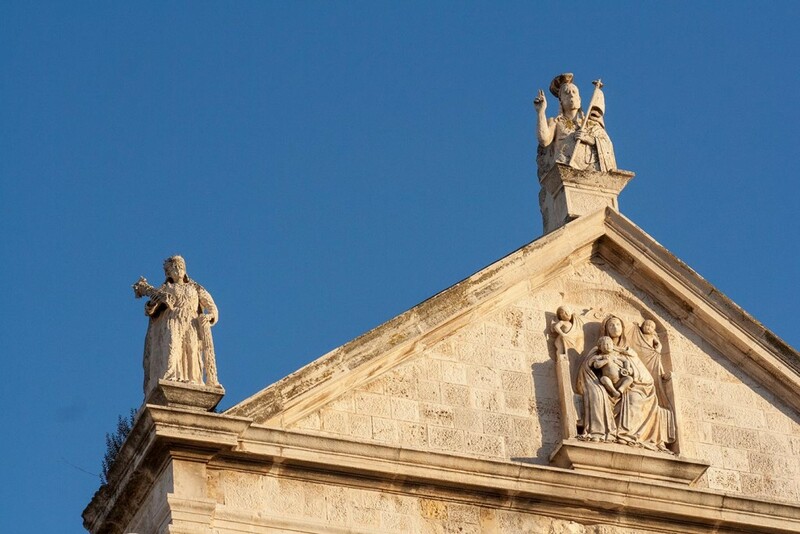 Also admire “Christ crowned with thorns”, “St Dominic” and “The Madonna and infant on the throne” on the spire. 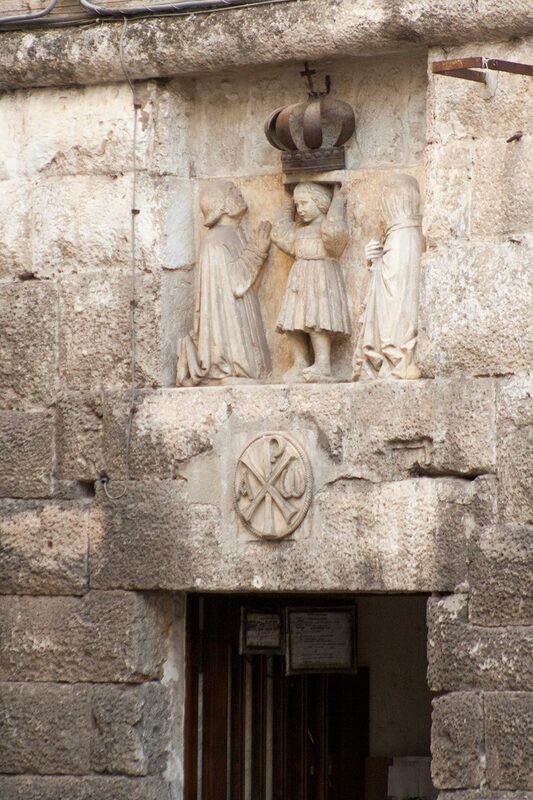 In the gable is the sculpture of “Ecce Homo” by the noted artist Stefano di Putignano. This building and its artists have been a reference point since the 1500s. The church, originally built outside the walls, was a wish of the Dominican priests and it was rebuilt within the city walls together with its convent. 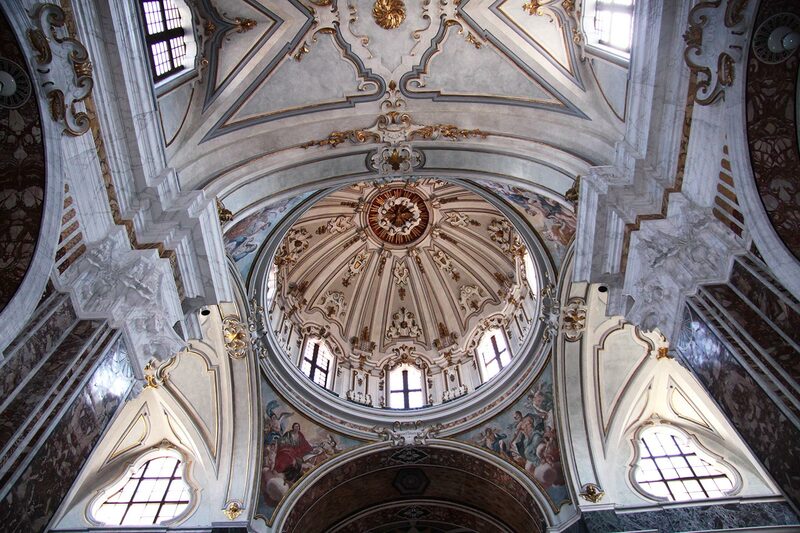 The inside of the church is marked by three naves with a high dome and a rich apse reminiscent of the Gothic style. Other styles are visible: the Gothic style is evident near the Renaissance dome. 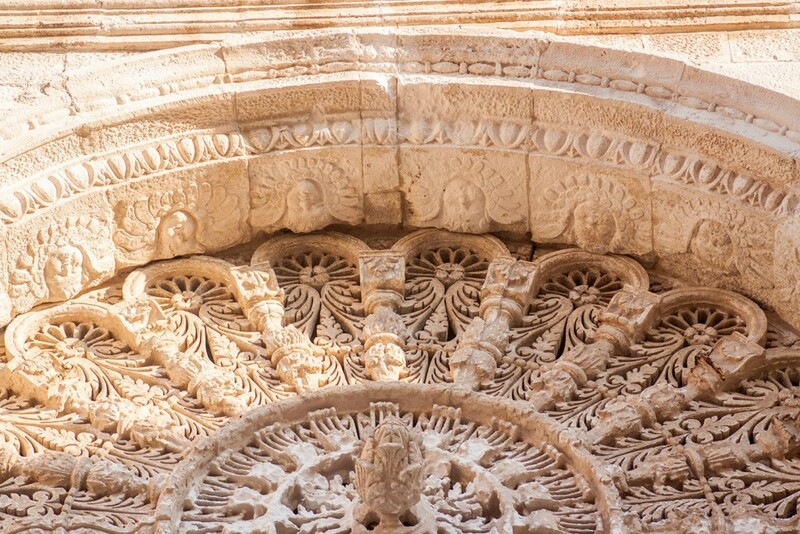 The sophisticated and ornate door frames of the apse are met by the tarantulas of the altars of the Salento region. Attentively consider the painting that decorates the central nave’s wooden ceiling (1703), a work by Gerolamo Cenatiempo, where Saint Dominic is prominent. 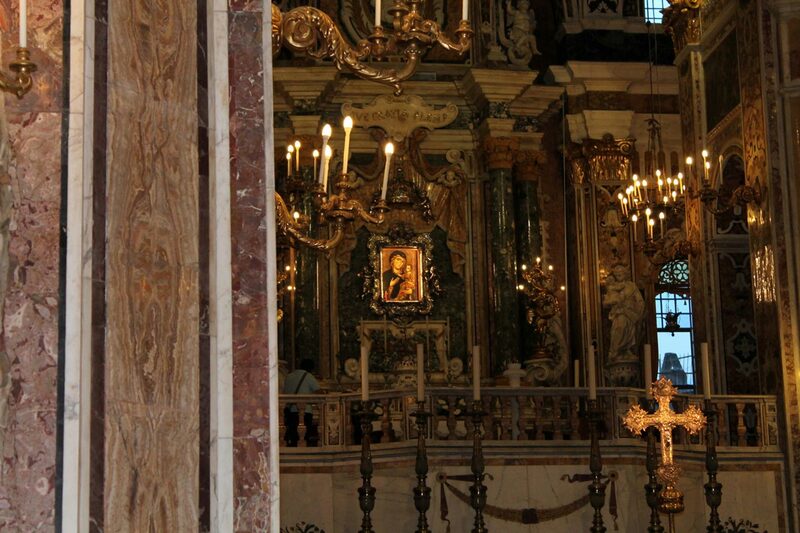 He is also visible in the painting by Palma il Giovane, on the left wall of the transept, where he is joined by three Saints in the miracle of Soriano. Equally remarkable are the choir and the wooden pulpit. 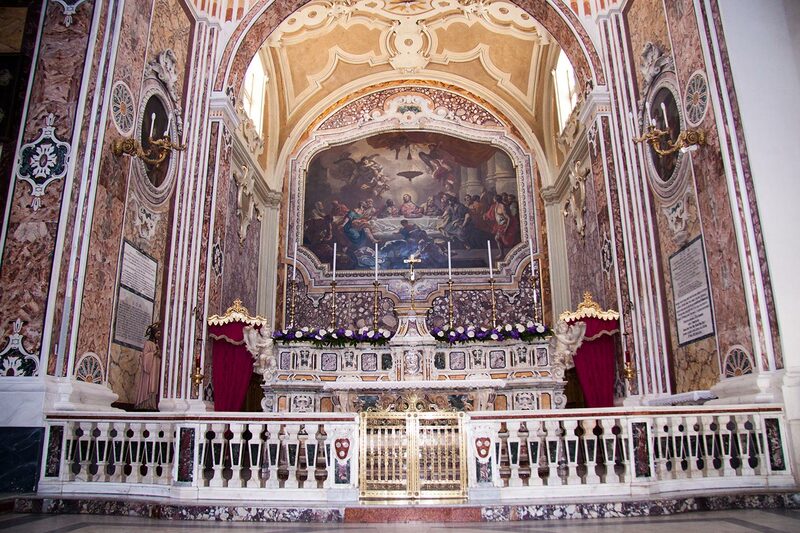 Also important are the different paintings and the gorgeous altars in Neapolitan and Lecce school. The church is located in Plebiscito Square. 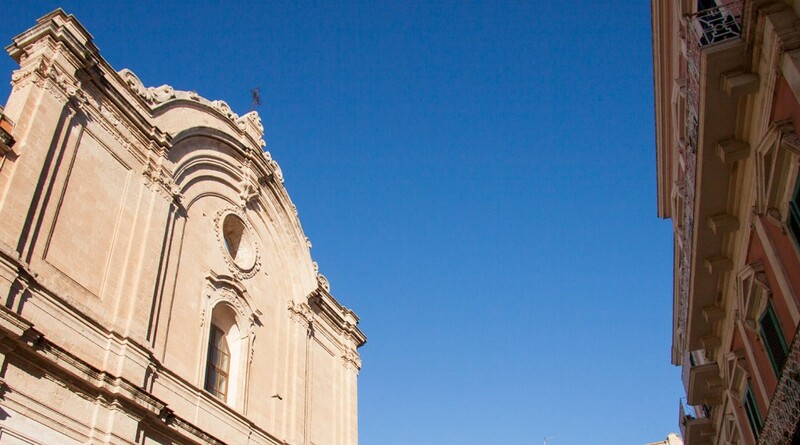 Between the Murat area and the Old Town, before crossing the ancient “merchants’ road” (Via Garibaldi) you will find the church of St Francis of Assisi of the Order of Friars Minor Conventual, finished in 1749 by Michele Colangiuli. 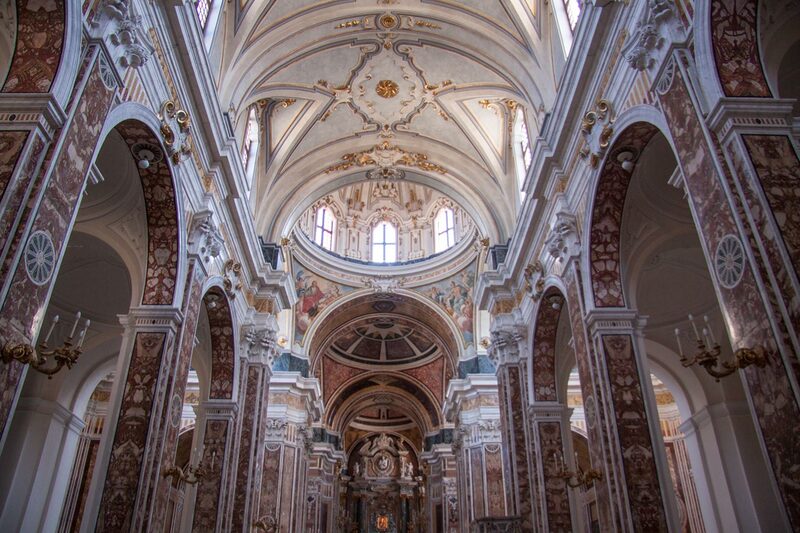 The volumetric and spatial characteristics of this church are a magnificent example of Renaissance Baroque style and the visitor is immediately aware that this is the most interesting local church of the 18th Century. The wide façade has a opulent doorway brightened by an oculus and a window. Once inside you will immediately notice a central plan with a single nave, a dome and a deep apse. 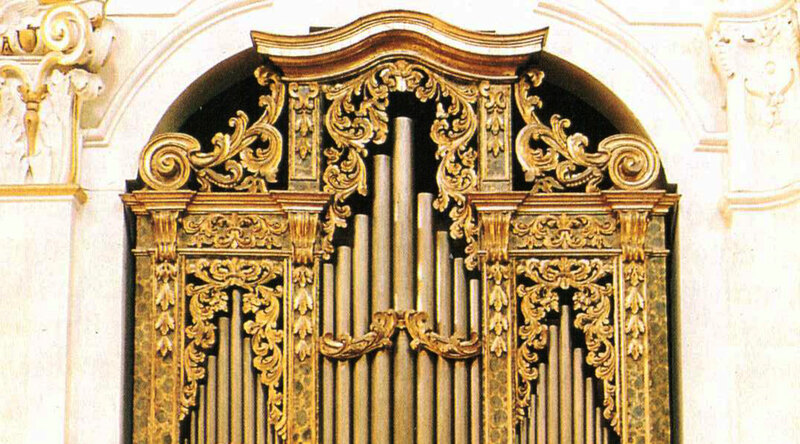 The columns sustain the lintels of the side chapels, whilst the structure of the vault is more harmonic. 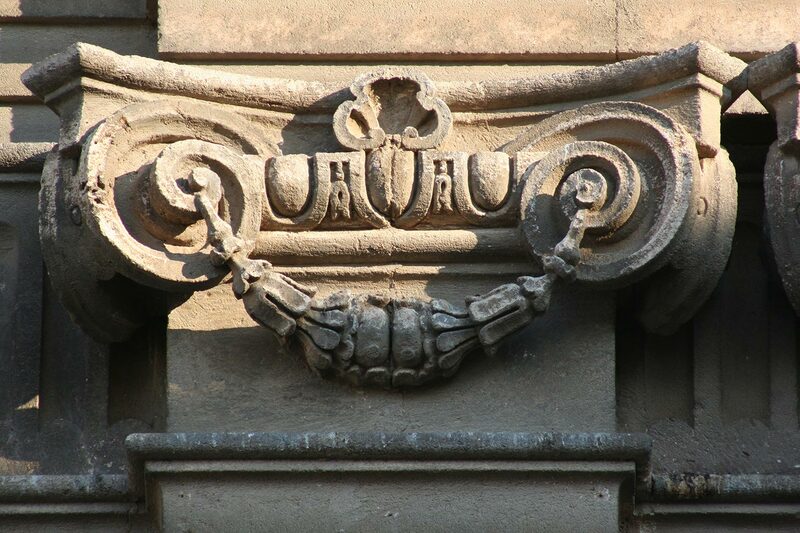 For the stucco works Colangiuli engaged Carlo Cassino, a Milanese architect. His architectural style is based on design and light, the stuccoes – whose function is also to highlight different shadow contours allowing lighter surfaces to emerge- have an important role. 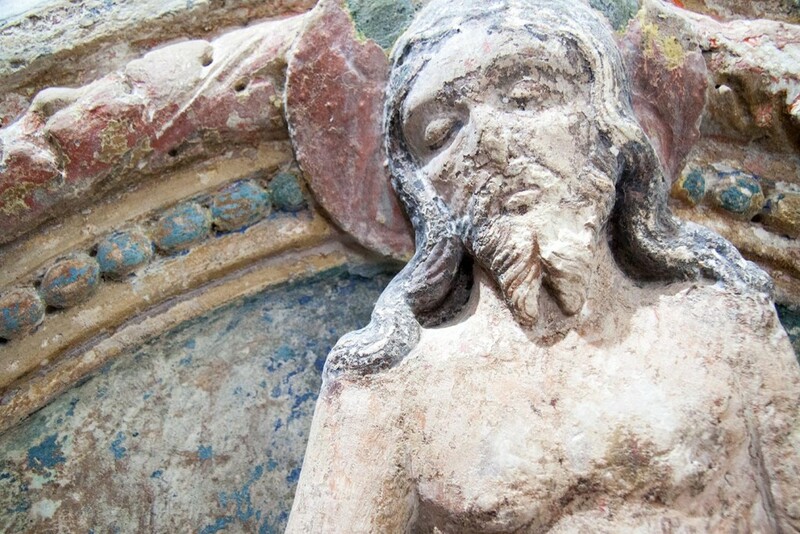 There are different and important artworks, for example the Crucifix on the main altar, one of the most remarkable wooden sculptures of the 14th Century. Also of important artistic value is the organ dated from 1710, manufactured by the organ masters of the Napoli area. This church was the setting for an important election on 21st October 1861, where the population chose to join the Kingdom of Italy. Close to the historic Garibaldi Square you can marvel at one of the primary examples of Romanic architecture in Apulia. The church of St Mary of the Amalfitani is adjoined to the oratory of St Joseph, partly demolished to highlight the church’s important and external apse with its rich and varied decorations. Nearby there is also the city library and the historic municipal tower with “the column of infamy” below it. 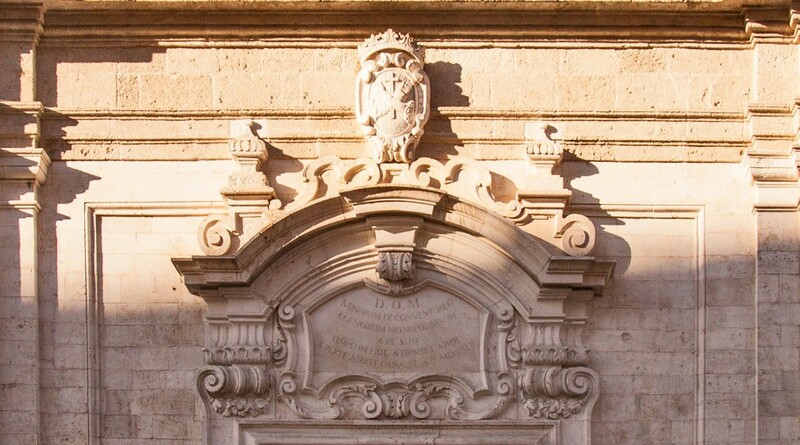 The main façade was rebuilt in the 18th Century but inside it retains the charm of the most interesting and harmonious example of Apulian Romanic style. 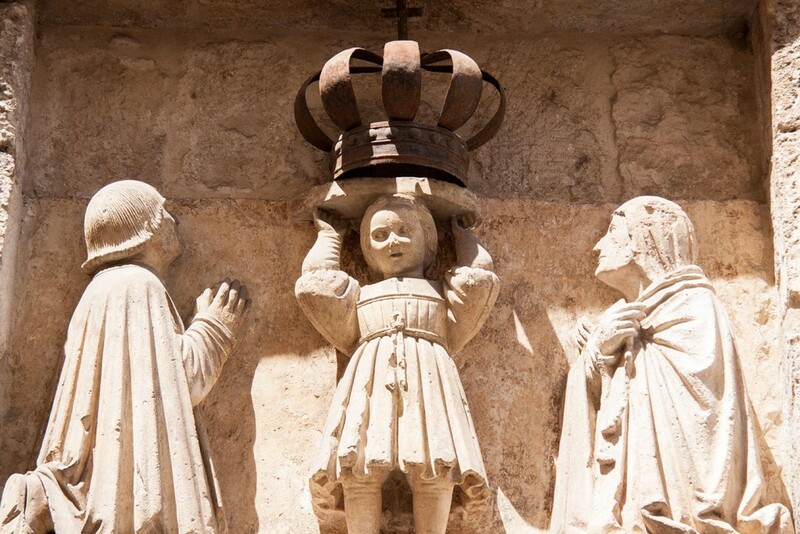 According to legend, the church was erected on a pre-existing 12th Century Basilian crypt by some fishermen from Amalfi (miraculously saved from a shipwreck), from whom its name derives and dedicated to the Madonna. Today, the church has a basilical plan and is divided into three naves, leading to the all important apse. You will then admire a series of slender arches linking the columns and the different capitals with distinctly Romanic features. From the inside, through the stairs in the right-side nave of this Romanic church, you can access the crypt which is preceded by an ancient burial area. The lack of a division between the naos and the bema indicates that this was a western Christian religious environment. Of its original wall features only a fragment of Saint Nicholas’ icon remains telling his life stories, whilst the other frescoes visible are of the 1700s. In the 18th Century the overlying architectural structure and the walls underwent different procedures making them more Baroque in style. 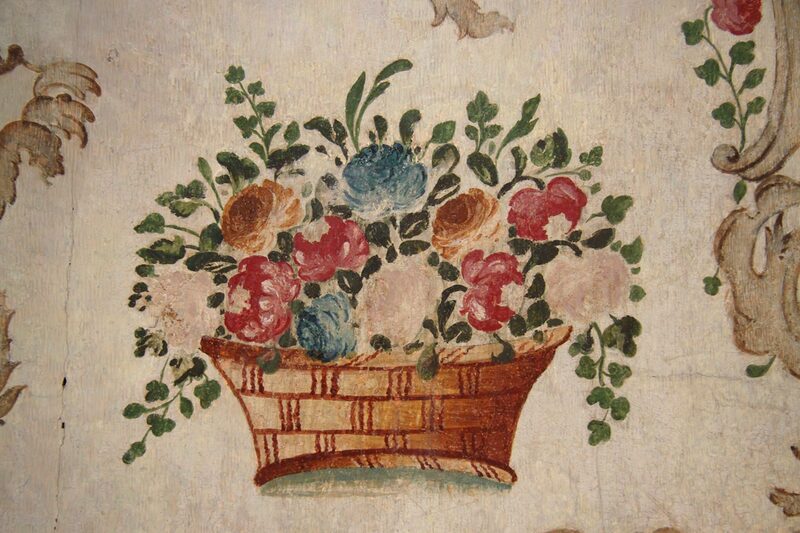 In the old crypt you will see more remains of frescoes representing St Nicholas’s life and other decorations. Also noticeable, externally in particular (access though the left nave), are the rich decorations of the three apses: columns, capitals, curved fascias and sculptures.